John Cawley reflects on Scottish politics as a spectator sport. The revolving doors between politics and commentariat are at the heart of a closed world where media, public relations firms and politicians rule over a broken system. As a boy, I loved Danny, the Champion of the World by Roald Dahl. I still love it and have read it to my boys. One of the most striking incidents is when Danny is alone in the woods, searching for his father in the dark. His terror is summed up brilliantly by Dahl in the phrase, ‘Silence was listening to silence’. I found myself reminded of Dahl’s profound and unnerving silence as I once again raised an issue at the heart of the Scottish body politic and was met by the same silence Danny would recognise. It is the deafening silence when an outsider questions any insider, any Scottish politician, spokesperson or journalist on the influence of lobbyists in Scottish political life. It is a silence that speaks volumes. It is a silence that has frightening implications. I am a fifty year old, a teacher of English with a degree in English and Politics, but recently, like young Danny, I have found myself lost in the woods of Scottish politics, calling out into the silence. Why do I feel this way? Well, I have come to the conclusion that Scottish politics is merely a pretence, a pantomime of democratic agency. Whenever I question any Scottish journalist about lobbying, the rest, as Hamlet says, is silence. My job as a voter is to traipse into the booth, cast my vote and then leave the real politics to the real movers and shakers: the politicians, the journalists and the lobbyists. Funnily enough, often the politicians are journalists and/or lobbyists. Or the journalists are ex-politicians. Sometimes, the journalists are also lobbyists or ex-lobbyists like Chris Deerin, formerly of the Daily Mail, who had a spell at Charlotte Street Partners (CSP) lobbying, advising or whatever Mr Deerin did at CSP. Anyway, Chris is ‘back to the tools’ as my carpet-fitter mate says, at the New Statesman. What brought this piece on though was a little thing, a wee straw in the wind, a minor interaction on Twitter, but one which illustrated to me a profound disconnect between Scottish political culture and the Scottish electorate. My contention is that Scottish politics positions the electorate as spectators, like Holly Golightly in Breakfast at Tiffany’s, looking at the wealth, the gold, the substance, but from outside. 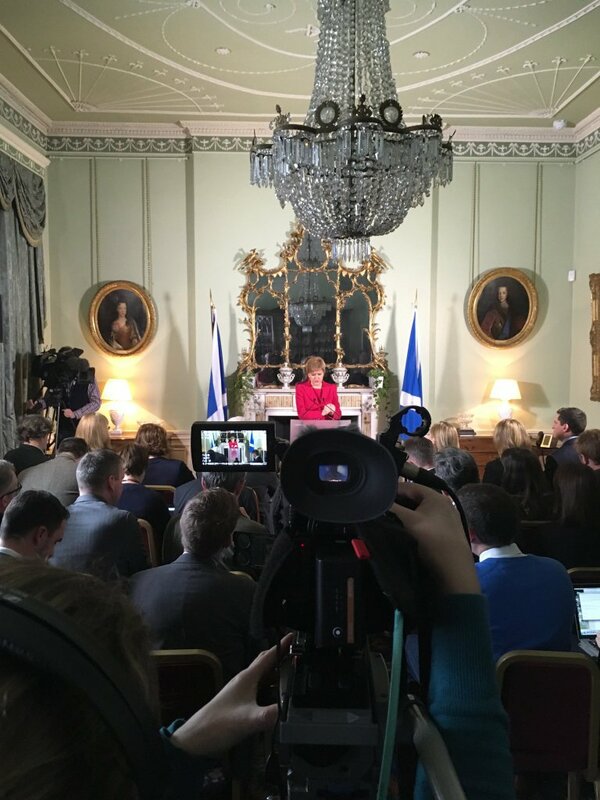 We, the Scottish public, are simply relegated to spectators – the professionals; not just the politicians, but the lobbyists and the journalists, they are the gilded insiders. All of this just because I questioned Aidan Kerr, STV’s Digital Reporter, about the propriety of him recommending Charlotte Street Partners’ Daily Briefing. Aidan did not respond. Aidan doesn’t think there’s a problem recommending CSP’s Daily Briefing, but STV has a public service responsibility as does Aidan, whereas CSP are simply engaged in the monetising of Scottish politics, red in tooth and nail. Aidan’s recommending CSP’s Daily Briefing is the tip of the iceberg, though. CSP handle STV’s public relations. How willing would STV be to reveal malpractice or wrongdoing at CSP when the broadcaster has a commercial relationship with the PR and lobbying firm which employs ex- journalists, ex BBC staff or, as with Chris Deerin, ex journalists on well-paid sabbaticals with CSP. Chris is well-connected and now CSP benefit from those connections at the Statesman. Does the public benefit? What have the public got to do with it? CSP recently got the gig handling Rupert Murdoch’s public relations in Scotland according to The Ferret. CSP are probably the most influential lobbying and PR firm in Scotland. Lobbying is the apotheosis of the art of politics- insiders doing deals behind closed doors- while we, the electorate, well, we’re on the wrong side of the door. Inside, Andrew Wilson, former MSP, Times journalist and member of the Scottish government’s Growth Commission is doing deals accompanied by Kevin Pringle, former SNP communications chief and Times journalist. Both busily monetising their political contacts and their political expertise to the benefit of the clients who are paying Wilson and Pringle for the access to the power and influence they offer. Ask about their client list, that’s for Kevin and Andrew to know, not for the Scottish people to find out. Sometimes, we get to see the insiders at work: former Conservative party guy Moray McDonald, now Weber Shandwick big noise, appears on BBC Scotland TV or radio or Tom Harris, former Labour MP, now Telegraph journalist, Reform Scotland board member, Scottish Vote Leave chair and lobbyist with Message Matters (Tom is the insider’s insider) often appears on STV or the BBC giving us his view as the experienced politico/journo/insider on the affairs of the day. We might be interested in politics, but Tom, like Michael Caine in Get Carter, well, he does politics for a living (a pretty good one I’m assuming.) Ask Tom how he got the Vote Leave gig and you get short shrift. Wait for one of Tom’s pals in the Scottish media to take Tom on with regard to the disastrous implications of the Brexit he promoted after a career spent in parliament consistently voting in favour of European integration – well, you’ll wait a long time. Kevin Pringle or Andy Maciver (ex Tory ‘comms guy’ and colleague of Tom at Message Matters) might appear with Gordon Brewer or John Mackay giving their insider’s take on the issues, but what they’re really doing is illustrating that they are inside: acting, moving and shaking- we are outside- spectating, noses pressed against the glass as these political princes give us a glimpse of the expertise and the access they sell to their clients. Sorry to disagree with Beyoncé, but when she asks ‘Who Run the World? The real answer is not girls, it is entitled, white middle-aged men. This is not to denigrate or devalue the status or contributions of people like Angela Haggerty or Lesley Riddoch or Cat Boyd or organisations like Women for Indy or the WASPI women, but in a Scottish political culture where ‘manels’ are still a regular occurrence, these women don’t need this weatherman to tell them which way the wind is blowing. The journalist Jay Rosen writes about politics as an insider game in his article ‘Why political coverage is broken’ which, while lengthy, bears out this argument but from the perspective of Australian politics. He describes how the media is complicit in the insider game which positions we, the audience, as outsiders. Rosen also touched upon what he calls the production of innocence’ by which he means the media pretending it is simply a neutral observer or messenger, rather than an integral part of the process that excludes those affected by those inside. So broadcasters, the BBC and STV add to the cachet of the insiders because appearing regularly on Scottish TV or jousting with Gary Robertson on Good Morning Scotland demonstrates just how inside these insiders really are. On one memorable night, Tom Harris appeared on the now defunct Scotland 2016 on the BBC and then walked across Pacific Quay to appear on STV’s Scotnight. I mean, come on, what client of Message Matters could not be impressed by just how connected Tom is? It would be mad not to hire him. How can I object to a bunch of guys just making a living? Well, it’s like this: all these guys know each other, have worked with each other, socialise in green rooms with each other, go for a drink with each other and share inside jokes and insider anecdotes with each other. Where are we, the Scottish electorate, while these princes of politics, media and lobbying are rubbing shoulders, cutting deals and networking busily? We’re watching passively on TV. We’re on the wrong side of the door while the insiders are inside, making deals, opening doors for their clients. David Cameron said that the next great political scandal would come about because of lobbying. He may be right. However, my fear is that we would not find out about any lobbying scandal in Scotland, simply because the journalists, the lobbyists and the politicians are all the same, part of a caste system, sort of like Scottish Brahmins. Brahmins are the highest caste in Hinduism. The politicians, the journalists and the lobbyists are all Brahmins. All of these pals or cronies, these insiders, their relationships transcend political parties or professions. The Daily Mail’s Scottish editor is now the Scottish Labour Party’s press guy. Why? Because he is an insider able to communicate with other insiders. The fact that I, a simple Labour Party member find it unthinkable that Alan Roden can seamlessly move from the Mail, a paper which is the implacable enemy of all of the values I hold dear, to the party which has been the recipient of my votes since 1987, is neither here nor there. This privileged few, this happy few exist in a hermetically sealed world. Any outsider, say a middle aged teacher, who questions this caste, is likely to be ignored, or to have their mental health, their fitness to practise their profession or their integrity questioned. Why? Because Scottish politics belongs to the insiders, the princes. We get to vote and sometimes we even get a wee chance to chin them on Question Time or a heated debate. Sometimes we might get our two minutes of fame as we’re asked a question when they have to do a vox pop in Shettleston or Knightswood, Oxgangs or Whitfield at election time, the rest of the time – Scotland, its power, it’s politics and its media belongs to The Princes- the politicians, the journalists and the lobbyists. We are spectators, enjoying the scandals, the confrontations and the gaffes, but the real business is happening behind closed doors. Should anyone disagree with my argument, try discussing links to lobbyists with Scottish politicians, spokespeople or journalists on Twitter. Ask a lobbyist how democracy is served by closed doors behind which gilded insiders monetise contacts and experience for the benefit of other gilded insiders. Silence on this issue is golden, especially if you’re on the inside. This a splendid piece. It highlights exactly what is wrong with Scottish politics and the way it is covered by the mainstream media. So, maybe I already knew or had guessed as much, but there’s absolutely no-way that I would ever have been able to get anywhere near to the clarity achieved here by, John Cawley. A very fine piece. I agree entirely with the above comments. The article does highlight the serious sickness at the heart of the Scottish body politic. There was a time when the British press had some integrity, sadly long gone. I blame, Murdoch, Dacre, the Sun, Daily Mail and Express. It is not all baaad when the Scottish Daily Mail today on its front page headlines in inch0high letters “How much pain would you endure for a perkier BOTTOM ?” (to ensure that the message would be clear to its readers, with picture of knickered bottom). All is well with the World when bums get the front page in Scotland’s best-selling newspaper. Thank you John for putting my thinking into words , excellent ! Excellent, John. A much needed articulation of what must be a widespread concern among the Scottish Electorate. In an independent Scotland, political lobbying ought to be outlawed as an affront to democracy. The Democratic Deficit is obviously as real in Holyrood as it is in Westminster. Yes – but what’s to be done about it? How can you legislate against people talking to one another? How can you legislate for who is asked to appear on radio and television or write in the other media? I’m all questions and no solutions – I do recognise that there can be rules governing lobbying but I would query their effectiveness in terms of the bigger picture as opposed to limiting actions by individuals. It is “the way it is” that certain types of individuals (sorry about such generalisation) will be attracted to the power broking “scene” and it is also a fact that the vast majority of people are not going to be interested in the detailed workings of the political and governance system. I am genuinely interested in being put right about my pessimism. How can you legislate? Well, you don’t let lobbyists unduly influence the drafting of a lobbying bill that is so ‘light touch’ as to be almost useless in regulating lobbying. If you’re a broadcaster, you don’t have commentators who are lobbyists unless you specifically mention they are lobbyists. You also try to vary the commentators you use. You might also, if you’re a national broadcaster be mindful of your public service obligations and mindful of the baleful influence of lobbying on contemporary politics. If you’re a national broadcaster you might even think it worthwhile investigating the influence of lobbying companies like CSP on the Scottish body politic. You might look at who books guests? You might have a ban on lobbyists appearing as commentators. In other words, you might do your job! Exactly! On BBC Scotland’s GMS yesterday the “expert panel” interpreting the election for us consisted of Tom Harris (see above), Andy Collier (“communications professional”), Siobhann Mathers of Reform Scotland (a think-tank commander who “has worked at all levels of government in Brussels, London and Edinburgh”), and Peter Duncan (former Conservative politician). So the usual coffee and biscuits with the insiders. Graeme, just for your information, Tom Harris is employed by Message Matters where his boss is Peter Duncan. Tom sits on the board of Reforrm Scotland alongside Siobhan Mathers. Message Matters has Reform Scotland as a client. Listen to yesterday’s GMS and see if these relationships or other connections are mentioned at any point. I have contacted the BBC about this issue before, to no avail. Many thanks for joining the dots, John. ‘Even cosier than I had imagined! Eddie Barnes, you’ve missed Eddie out. I can put you right about your pessimism. Its noting to do with the media. Its all about your denial of reality. As with John Cawley and every othe commentator on his article here, it is your inability to accept the fact that Scotland rejected independence in 2014. And it is compounded by another unspeakable fact; the SNP are no longer an independence party. The SNP machine have now accepted independence is a lost caused. They know a second referendum is an unattainable fantasy. They speak of it only to placate their unquestioning masses. They know, unionists will never agree to one. They know if they were to hold a second referendum, unilaterally, it would hold no legitimacy as the unionists will never take part and that the result will therefore be no consequence. So what is the alternative for the SNP army of advisers, MPs, MSPs, members and supporters? (note the order), Is there one? They could have made this general election their referendum. They could have stood on a manifesto promise of one commitment, ‘vote for the SNP and if a majority of SNP MPs are returned we will take this mandate from Scotland to Westminster and negotiate Scotland’s independence with the next UK government’. They chose not to. Their preferred tactic is deception. Say one thing do another. And their is nothing wrong with that in politics, if it is going to work. This deception is not. The strategy the SNP have constructed is this: convince the masses the time is not now. Brexit will go wrong. Wait until we hold the high ground, until all of Scotland is behind us and then we will win. That as I say is a deception, infact it is more that that, it is a lie. The SNP generals know there will never be another referendum. They have decided instead not to wreck the machine. There are after all a lot of very good jobs directly and indirectly associated and a lot of patronage to be bestode. There preferred option is to become the Scottish Devolution Party. They now see themselves in the roll of the white knights from north of the border, down at Westminster to show decency and fairness, to fight the corner of the old and infirm all across the United Kingdom. Westminster is not such a bad place once you get used to it Gordon. You cant really blame them. So chin up, less of the self indulgent pessimism and a bit more of some healthy cynicism. It will help you see things a lot clearer. Reluctant as I am to engage with someone who so egregiously misread the article, you must have missed the part where I said ‘their relationships transcend political parties’. This is not about yes or no, this is about the elite political commentariat of all parties and none stitching up democracy. I am a democrat to my core and I see the issue I explored in the piece as going to the heart of Scottish democracy. likewise the same sad situation seems to exist in the football industry, involving players, agents, club owners, managers, sportwriters etc etc… all living in each others pockets, all pissin in the same pot. An excellent piece on a subject that deserves a far wider audience. Particularly within the wider pro-independence movement, as it would be foolhardy in the extreme if one was to assume that by substituting one group of insiders for another a thousand flowers will miraculously bloom. Indeed, within the present SNP administration it is all too easy for a Government that correctly sees itself on the receiving end of wilful pro-British establishment harassment and misinformation to retreat in fear to its own defensive laager. Within which even valid criticism, is met with hostility and suspicion if not outright accusations of betrayal. I fully accept that the SNP must walk a fine line in this regard. Particularly as even some prominent supposed supporters of independence cognisant of the realpolitik of the situation must needs be seen at least to run with the hares and hunt with the hounds. No the only way the too cosy relationship of the media with politicians can be addressed is if it is conducted in the full glare of the light. In addition, I believe it is long overdue that lobbyists of any persuasion were put on a legal footing and their conduct regulated and exposed. This to me would seem the only way to respond to the ubiquitous Tom Harris’s of this world who so dominate our airwaves, but do not as far as I can see represent a substantial body of Scottish opinion. Outside that of professional lobbyists and unemployable centre-right politicians and journalists. Labour have been literally kept alive in Scotland due to their relationship with the bbc in Scotland, press in Scotland and support from varying groups based outside Scotland including big business, some unions and the britsh / English elite. The SNP have flourished despite having none of the above! Many times people on here and elsewhere state the SNP are not perfect, but they are head and shoulders plus a country mile above the rest. The SNP are trusted to do what they say they will do, labour and tories are not trusted, how may positions can Davidson or Dugdale hold simultaneously? Yesterday I thought was an all low point for unionism when the red and blue tories stated democratic mandates don’t matter, if they say something is not going to happen (referendum), it will not happen! And guess what, the red and blue tories will use their pals in the bbc and press to over turn a democratic mandate, not only of the SNP, but the stated will of the Scottish Parliament, therefor the people of Scotland. Absolutely shocking, and those like the author of this piece should hang their head in shame at continuing to support parties that ignore democracy. With out democracy, what future do we have? Indeed mark – the ‘insider’ accusation isn’t confined to one party or one side of the constitutional debate. Another thing the press and bbc have done in this current election is facilitate the judgment of the SNP government mid term whilst glossing over any scrutiny of the tories track record in government. As has become the norm, the SNP are judged differently and to higher standards than the rest. Where were the questions to Davidson yesterday on the deficit and austerity or the questions to Dugdale on trident or raising taxes when in Scotland the government can only raise taxes across the board and not vary bands? PFIs in schools is another example, from the coverage in the press and bbc, where was mention that this was a labour policy, conceived by Brown and enacted by McConnell? Labour supporters rather than standing up and holding their hands up, slunk away whilst the the uniformed assumed the SNP were to blame. Silence! Seems to me there is a lot of silence, especially those in Scotland from a supposed progressive labour view that should be raising concerns about how the government in Scotland, their country, is treated by the Bec and press, a bbc and press controlled outwith Scotland. As a life long SNP supporter I can see the lies and falsehoods the bac and press portray about Corbyn and I am happy to state it, but when it comes to the way the SNP are portrayed and judged, silence! You say, ‘Reluctant as I am to engage with someone who so egregiously misread the article….’, tough, you are engaged. Let me explain something about Scotland’s media, that ‘privilged club’ in their ‘hermatically sealed world’ where ‘Any outsider, say a middle aged teacher who questions this caste, is likely to be ignored…..’. John, sit down, you are part of the Scottish media scene. You write aticles for Bella Caledonia. That in itself does not get you membership but when you press ‘Send’ it does, your in. I’ll tell you what the difference is between you and your fellow members, what I think gets under your skin; they get paid for it and I suspect you dont. I’m sure John is as flattered as I am Richard – but do you really think being the editor of the Daily Mail (Alan Roden) or the head of comms for the Tory Party (Eddie Barnes formerly Scotsman hack) or being with Charlotte Street Partners is really comparable with publishing a guest blog on Bella? The reality is that John has just laid out the cosy fetid networks that are cultivated in Scottish politics and the problem this creates for a functioning democracy. I don’t think its very controversial is it? Do not underestimate the part BC plays in Scottish politics. All sides read it. It is an influential conduit. Richard Mackinnon appears to be determined to play the Roger Irrelevant card today. He seems to feel compelled to comment sourly on anything which appears in Bella Caledonia without taking the trouble to understand the content. He gives the impression of wanting to bring everything back to the subject of Scottish independence. He claims the ability to read minds and understand the motivations of people he has never met. John Cawley describes himself as a teacher of English. He does not appear to be a lobbyist, a spin-doctor or a politician. There is no indication that he sits on the board of any policy think tank. He is not employed by a public relations company. In what way can he be seen as part of the cliquish system he criticises? My point to John is, his sourness toward the Scottish media is unfair, as they are no different from the rest of us, they are only trying to make a living. I also think his criticism sounds over sensitive, as if it is a personal matter for John. That John chooses to publish the issues he has on a well recognised Scottish public media forum, in what is a lengthy article is in itself ironic in that in doing so makes him a member of the club he dislikes so much. A good article and some good comments as far as they go. What John Cawley is describing is only a small section of the lobbying that is done in Scotland – but I appreciate that he has focussed on a particular part of the lobbying industry in Scotland, in order to make a point about `small country syndrome`. Scotland has always been regarded by those Scots with knowledge of the wider world as prone to cronyism – that’s not something that sprang up overnight with the creation of the Parlie. The principles that were laid down by the Constitutional Convention included the inclusion of `civic Scotland` in the business of the parliament. Of course, no-one at the time defined who or what `civic Scotland` actually was or should be, but it was generally taken to mean that the people of Scotland would be able to participate in the activities of the parliament, where they wanted to. Yes, individuals can and do submit responses to consultations, attend Cross Party Group meetings and submit petitions, but the `real business` of the parlie and the government is only really affected by those with power. It is too easy for the parlie and the people who are closely involved in its work to exclude others and to ignore entirely reasonable questions and issues. The parlie’s politicians were easily able to deflect attention away from their own Lobbying Bill on to the Westminster Lobbying Bill, which sought to curtail the activities of the Third Sector during election time (something that Greenpeace has fallen foul of because of the overriding of the Fixed -term Parliaments Act). This has permitted a situation to continue where the `insiders` can operate with impunity. Within just 18 years, the parlie has passed a huge amount of legislation, some of it rightly acknowledged to be of poor quality, and the committees have failed to live up to even Westminster standards of scrutiny. There have been some excellent petitions, but they have all been batted into the long grass. The issues raised by these petitions have been ones that would have cost little, or would even have saved the public purse considerable sums of money. They were entirely within the powers of the parlie and the government, but nothing has come of the huge amount of work put into them by the individuals and groups who put them forward. The people’s parlie is anything but. It receives good press precisely because of the operation of the North British establishment, who are completely averse to making any comparison of Holyrood with Westminster that is negative. Even the Tories have realised which side their bread is buttered on – their own `political comeback` would be unlikely, were it not for the profile that the parlie has given them. Whilst John Cowley’s article is well researched and very welcome, all those who want Scotland, whatever its constitutional status, to be a better, fairer country, need to agree that the situation that he describes is indicative of a wider malaise, not just of political insiders filling their boots, but of the inclusion only of those who offer little in the way of real criticism. In the same sense that real friendships need honesty, those who truly think that independence is the best constitutional settlement for Scotland need to realise that continued cronyism is a sure-fired way to undermine the case for independence. Fiona, thanks for the comment. Do you work in the third sector? You seem to be writing as someone who has been on the sharp end of the issue! Could you do me a favour? Not one mainstream journalist has responded at all to the piece despite me tweeting the link, so if you could tweet a link to your followers, it might get a bit of traction. I have made a submission to the Parlie on the Lobbying Bill, I have complained to the BBC about the cronyism they enable, but Bella is the only space where these issues are highlighted. Is this insight, as the phrase seems to imply, impossible to attain by those who are not globetrotters? Is cronyism a specifically Scottish trait? Or might it be found elsewhere? London & the Home Counties? I would class the Westminster stuff more as corruption – although that is not a word that British culture encourages us to use. Of course there is cronyism elsewhere, and I’m not a globe-trotter, just someone who sees the connections that people in the North British Establishment make with each other. I suggest you check out all the public offices of the current chief executive of the Mental Health Tribunal Scotland – Dr Joe Morrow – if you want to get a handle on just how much power and influence is concentrated in the hands of some of Scotland’s `great and good`. Certainly agree Fiona, corruption is all around us, but particularly so in Scotland, where our nation suffers from the additional encumbrance of the elitist unionist influence surreptitiously worming its way throughout the leadership and senior management of Scotland’s several hundred public and semi-public institutions. A very real danger is that, post independence, these unionist elites will still be there. The first part of this is unexceptionable. But can you provide any objective statistics to support the second part? Can you also provide supplementary statistics for the previous answer which highlight the voting record in the fairly recent referendum of these corrupt locals/ Scots ? In addition to ‘class’ barriers prevailing within Scotland, the usual practice of advertising in London virtually all top public appointments in Scotland tends to imply that there is also a very high degree of import of professionals from rest-UK to help run Scottish institutions. As for the ‘Scottish Government’, the continued UK Home Civil Service control means Whitehall still make senior appointments across departments, even inside Holyrood Parliament itself, with a high proportion ‘sent’ north. This is all reflected in the historical Scottish census data over the past century, where the largest immigrant group to Scotland comprises people from rest UK, and mostly within the professions. Voting intention survey data during Indyref1 further suggests the rest-UK group have a very high (i.e. 80%+) propensity to vote against Scottish nationhood. Hence it is not difficult to see here that (a) an elitist group of Scots ‘run’ Scotland, (b) aided by import of ‘professionals’ from rest-UK, and (c) the vast majority of which are unionists. This tends to correspond also with my own personal experience working in the ‘Scottish’ public sector for nearly 30 years, and where I have researched and identified the very low proportion of Scots taking senior positions in for instance the ‘Scottish’ university sector. My articles on this were published in Scottish Review but have since been mysteriously removed from its records. Scottish Review is run by an avid unionist. If that single reply is in any way representative of the standard of Scottish university debate, and I am indeed aware that one swallow does not make a summer, perhaps complaints about excessive outside recruitment to Scottish universities should be taken with a pinch of salt. How about 17 of 19 Scotland’s universities not having a Scottish principal? If not corruption, maybe colonisation is the explanation? Or do you prefer to think Scots are simply inferior, that they are intrinsically unable to lead their own nation’s educational institutions? Is that not racist? You seem an especially lazy unionist Jim, unwilling to read up on any evidence, even when it is given to you on a plate. Now apparently I am asked to make the jump from Scottish cronyism/ Westminster corruption, very serious topics I have affirmed, to Scotland’s allegedly clear status as a colony of England, based specifically on the number of non-Scottish (as opposed to English, for though my expertise in the field is scant I believe that at least 2 of the persons in question are Irish viz “from a non-colony if ever I saw one”) principles of Scottish universities. Virtually without reflection, I prefer to pass. The above link gives you a flavour of the connections that just one person can build up. Personally, I don’t think that one person should ever be given that much power. w.b. – yes, who knows what happened there? Just the mere fact of being the President of the MHTS – effectively, the chief executive – should be opening up some enquiry in the mainstream `Scottish` media. Not a cheep has been said, apart from speculation about Dr. Morrow’s homosexuality in 2005. He `came out` himself only in 2015. The role of the Masons in Scottish society has been questionable for many years, and secret societies who offer explicit support to their members, regardless of their fitness for the position they hold, is part and parcel of the cronyism / corruption in society. All those who want a fairer Scotland need to face up to this. Of course, there are other `networks` operating in Scotland, where others are given a leg-up, but the Masons were created in Scotland and exported around the world. One of the many roles that Dr. Morrow has taken on was missed out of the above weblink – he was twice appointed to the board of the the Scottish Children’s Reporter Administration, back in the days of the Labour/ LibDem Scottish Executive. Of course, he was a Labour councillor in Dundee. People really don’t think much about what goes on the the mental health system in Scotland, but Dr. Morrow presides over a `service` that has the power to give forced `treatment` to people, in the form of extremely powerful drugs which can kill. The justification for using these drugs is 99% based on research that is funded by the companies who make them. No other part of the health system has that power. This is, in the main, to people who have committed no crime and some of whom have no mental illness (the definition of which is determined by professional opinion based on a set of criteria voted on by committee) – they simply have a Learning Disability or autism. Have Mike Small, James Kelly, Stuart Campbell (currently boasting 480k readers/month on “Wings”) or GA Ponsonby recently been invited onto any MSM, BBC TV or radio programmes to contribute their opinion or provide vox-pop analysis? I’m not 100% but I think GA Ponsony boycotts the BBC. I’ve been on BBC’s Newsnight equivalent a few times but not recently. Wul, Tom Harris and Andy Maciver are regular fixtures on TV and radio. Have a look at Andy’s profile pic on Twitter to see just how much telly he does. I was on Question Time about twelve years ago in the audience. Oh! I also had twenty seconds on STV during Indyref complaining about Better Together avoiding genuine debate and excluding yes voters from closed door events. Democracy should not be carved up behind closed doors. Labour treated Indyref as a municipal Labour stitch up and reaped a bitter harvest. Funnily enough, in my constituency, Kate Watson of the Better Together campaign is the Labour candidate.